When managed correctly, stress can actually be good for health. Stress can help the brain. Research has found that stress can make neural connections stronger and help memory. This applies to short-term stress, but not to long-term or severe stress. Studies have also found that short-term stress can help push the brain to an optimal condition. This means that the brain is forced to focus better and reach its highest potential. Stress can force us to re-evaluate deadlines and motivate us to take action to finish things on time. How many times in your life have you pulled together test prep, an assignment or a project at the last minute? A looming deadline can make you feel agitated and stressed, but it can also force you to take charge of the situation. This provides the motivation to stop procrastinating and complete what is needed. It can make us more flexible and broaden our understanding. Researchers believe that surviving short-term stress helps build emotional and mental resources. Stress can improve your immune system. A study, titled “Stress-induced redistribution of immune cells – from barracks to boulevards to battlefields: a tale of three hormones,” found that stress can actually help the immune system. Short-term stress can make immune cells jump into action. Adaptations help people stay strong and healthy under stress. Stress can serve as a signal. If you feel your body and mind are under stress, then it is probably past time for you to evaluate your life. Stress can be an indication that you need to slow down or make some significant changes. It can serve as a warning before serious health or life issues arise. If you feel you are under constant pressure, take the time to reflect on your concerns about friends, family, work, and other obligations. Your stress could be telling you that some things may need to be adjusted, so you are not constantly feeling overwhelmed. Stress can strengthen your relationships. Stress makes the body release oxytocin, a hormone, which can help you feel more connected to others. Oxytocin makes you feel like bonding with others and sharing your burdens. This can help you build stronger relationships with those you love. It can encourage you to share your troubles instead of letting them consume you. There is absolutely no doubt that living under constant, extreme stress is harmful to your mind, body and spirit. However, short-term stress does have a few benefits. It can advantageously affect your body and mind in a variety of ways ranging from motivation, to improved brain activity. Read more here. With new research on the physical aspect of stress, we are able to overcome stress in the moment and hopefully learn how to keep it from affecting us as much as possible. 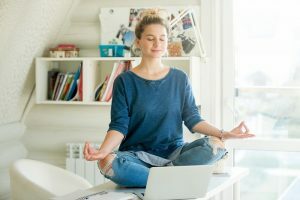 Melanie Greenberg, Ph.D., a clinical psychologist and executive coach, notes the key to destressing is to activate different brain networks to calm our minds down. This entry was posted on Wednesday, May 17th, 2017 at 11:25 am. Both comments and pings are currently closed.